Earlier this year, I decided to try the Bullet Journal system to see if it would suit my needs. So far, I’m finding it much easier to use than a pre-formatted paper planner. It is better for my tasks, thoughts, and notes. Having something physical seems to help me more than a purely digital system. Its main weakness though is dealing with events that are set a month or more in advance. I’m still looking for ideas, but a temporary solution is to build a list of items that are scheduled ahead, so when the month concerned comes up, I already have the item ready for me to transcribe. The other issue I had with the system is the space set aside for the month’s activities. One line per day doesn’t work for me, as there are several things happening on certain days. So I made a grid for the month instead. Thanks to Billie for the month grid idea! I did see other people print out a month calendar and paste it to the notebook, but I like being able to draw it onto the notebook. It gives it a more organic feel. Having a paper system also allows me to use my fountain pens and inks. To label the grid I used a Pilot Parallel Pen 1.5mm loaded with Noodler’s Baystate Blue. The notations are done with a Sailor Professional Gear Saporro Slim with a Saibi Togi nib loaded with Noodler’s Heart of Darkness. 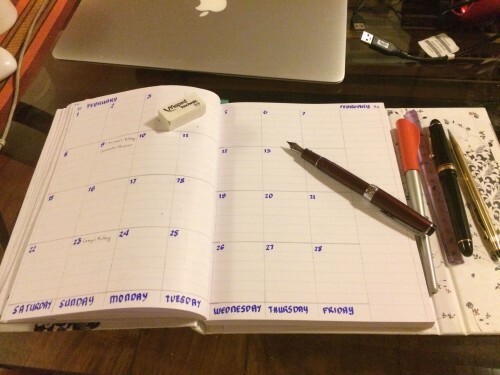 The Bullet Journal does call for a grid notebook, but when I was looking for a notebook to use, there weren’t any fountain pen friendly grid notebooks available that I liked. I saw some Miquelrius notebooks, but their pages are perforated. That feature, although good for other uses, didn’t match what I wanted out of the notebook. I wanted a bit more permanence to the pages. Also, the last time I used a Miquelrius notebook, the paper could not stand up to my use of flexy and italic nibs. There’s just too much bleed through that the reverse side of the paper tends to become unusable. I wanted to get a Rhodia grid notebook, but there weren’t any available here. So I ended up choosing a Clairefontaine notebook. Since they are both French brands, and since 1997, owned by Clairefontaine, it was still a good decision.